The incredibly long and sort-of-public gestation period of the new Toyota Supra means that by now, when the proud parents, BMW and Toyota, want to actually reveal the car, nobody’s going to care because we’ve basically seen it all already. While even though we’ve already driven the car, much of the interior and exterior were still hidden or disguised. Now, though, thanks to a bunch of parts renderings, we’ve seen everything. 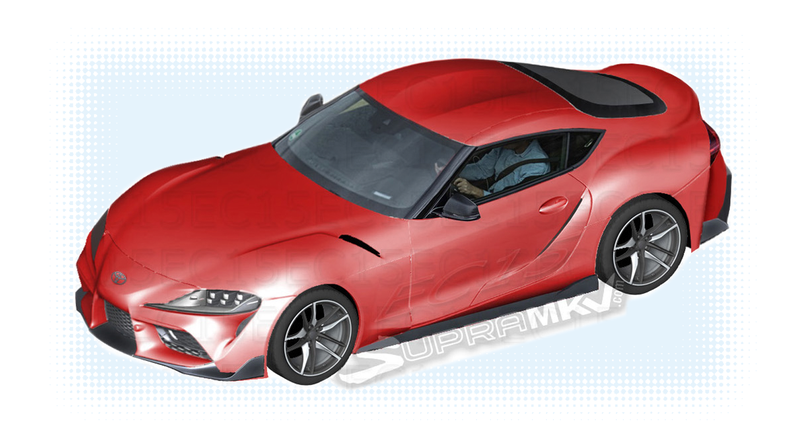 Our Supra-obsessive pals over at SupraMkV.com have taken those interior and exterior parts diagrams that have been leaked, and assembled them into comprehensive and seemingly very accurate rendering of the car’s exterior and interior. The interior was handled the same way. Keep in mind, when we were in the car, we saw the dash in a very disguised condition, so these dashboard and interior images are new. The center stack screen will likely be in a “floating” position on the upper dash surface, differing significantly from the car’s BMW Z4 sibling. What’s going on here with the Supra is sort of like what happened to Acura with its drawn-out NSX reveal: it’s been going on so long, with so many small leaks happening, that the eventual reveal can’t help but be a letdown. When Acura finally officially revealed the new NSX at the 2015 Detroit auto show, it was pretty upstaged by Ford’s launch of the GT at the same time, because the GT was a total surprise. Sure, we’re all excited about the Supra, but there’s really nothing left to be surprised about. Now Toyota just needs to hope that Fiat-Chrysler doesn’t decide to re-introduce AMC with a new AMX whenever they finally officially reveal the new Supra.